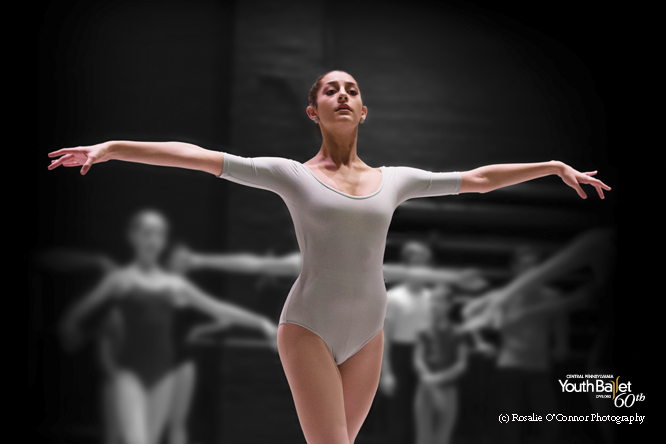 Cameron Essis Gildea is just beginning her professional journey, but she knows what belongs in the successful dancer’s toolbox. The works presented in Central Pennsylvania Youth Ballet’s 2016 June Series encapsulate the school’s six-decade commitment to rigorous training plus challenging choreography and performance excellence. Price Suddarth’s limit[LESS] immerses students in complex partnering and of-the-moment movement. George Balanchine’s Western Symphony and Emeralds instruct students in the seamless pairing of music and dance. In discussions of Balanchine’s choreography, especially, one word comes up again and again: Musicality. CPYB Chief Executive Officer Nicholas Ade credits Balanchine’s appeal to that musicality inherent in his works. “It has always been about his musicality, his refinement, his understanding of how women move in a classical sense, and being able to pull out personalities within the choreography to tell a story,” he says. 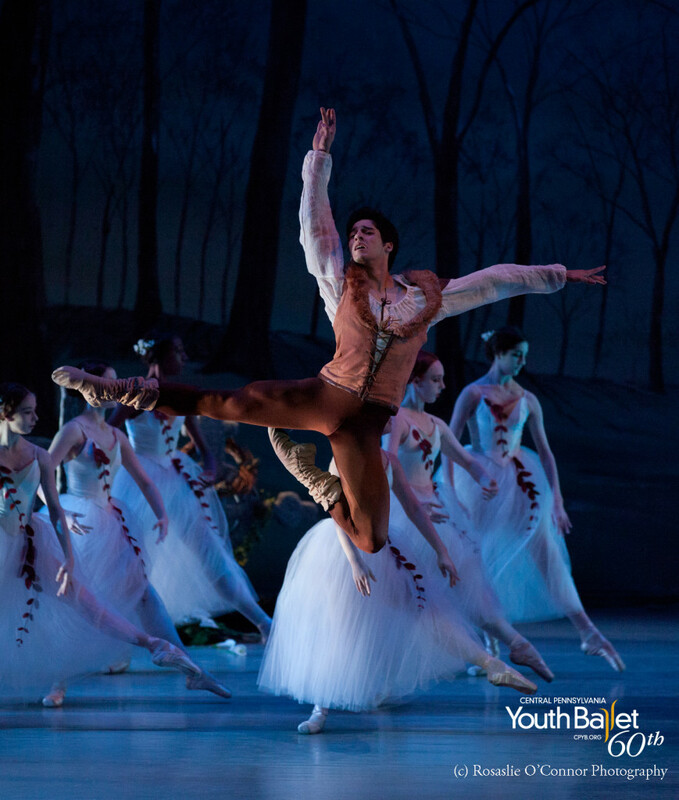 Julian Duque performing Hilarion in the Central Pennsylvania Youth Ballet production of Alan Hineline’s Giselle. Gildea credits her CPYB training for the versatility and adaptability she hopes will guide her through a professional career. When she trains her body to move in different ways, she is preparing to project a choreographer’s vision. Julian Duque (far left) with Miami City Ballet dancers in Year of the Rabbit. Choreography by Justin Peck. Photo © Leigh-Ann Esty. “Being able to perform at such a young age and grow up on stage makes you feel more confident and comfortable in dancing, and that’s what being a professional is about,” she says. Good choreography elicits reactions through its distinctive voice, but it also allows the dancer’s artistry to shine through. As always, the development of young artists is behind CPYB’s selection of performance works. Students experience the give and take of working with diverse choreographers – some of them living, like Suddarth, and others enduring through the oversight of their precise répétiteurs, like Balanchine and CPYB’S own Darla Hoover. “It allows them to explore their art and become artists at a younger age, which allows the maturing process to happen a little bit earlier as an artist but also allows them to feel comfortable expressing themselves,” says Ade. 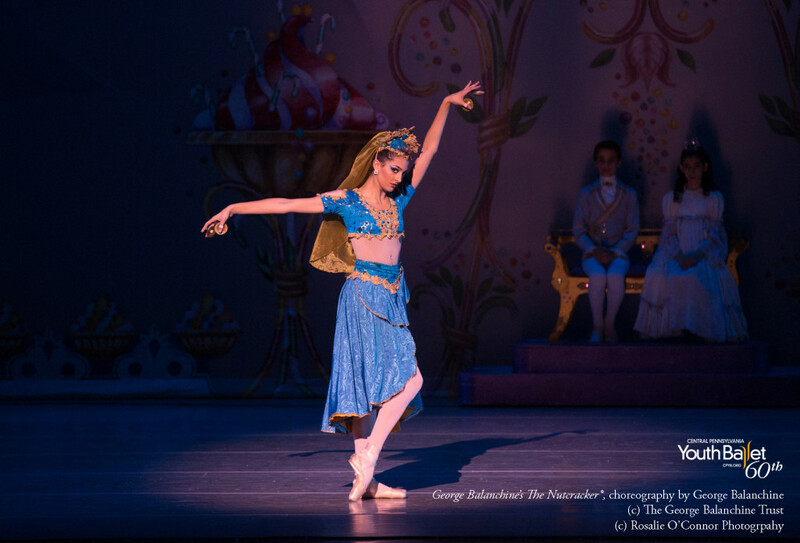 Cameron Essis Gildea performing Coffee in the Central Pennsylvania Youth Ballet production of George Balanchine’s The Nutcracker®. Which brings us back to musicality, Gildea’s “hearing through the steps.” A choreographer or répétiteur introduces students to the whys and wherefores behind each step, “why it should be smoother or faster or sharper,” says Ade. Musicality emerges when students hear a phrase, maybe a certain piano glissando or violin pizzicato, and learn to mimic it in their steps. With each performance work, students exercise their imaginations. They learn to empathize with their characters, enliven the stories they’re telling, and engage audiences. That’s when they catch a glimmer of the reward possible from all their hard work.